Indian names: vaka, kalivi, kalli (Andhra Pradesh); karamacha (Bengal); karmarda (Gujrat); karekayi, garji, kavali (Karnatka) karavada, karanda, karwant (Maharashtra) karondhu, garna, kharnu (Himachal Pradesh); karunda (Hindi); karamarda, avighna (Sanskrit) kalakkay, kalachedi (Tamilnadu). Garnu bushes can be seen very commonly growing in the forests and wastelands up to elevations of 1,500 metres. They are highly drought-resistant. They bear small fruits which are eaten by all. These are also offered for sale at many places. This shrub is found wild in most parts of India, especially in the dry foothills of the Punjab, Uttarakhand in the sub-Himalayan tract up to 4,000 feet. An erect thorny shrub, with forked branches, 2-3 metres in height; wood, very hard; bark, light brown to green, can be stripped off longitudinally by hand, exposing the white to light-green wood underneath; thorns, 3.2 cm long, brown to greenish at the base and deep brown towards the tip. Leaves, ovate, 4.5 cm long, 2.5 cm broad, leathery; venation, reticulate pinnate; margin, entire; petiole 3 mm long; leaves exuding a white latex, when plucked from the stem. Flowers, short-stalked, sweetly scented, bisexual, complete, ebracteate, cyclic, actinomorphic, their colour varying between white and camellia rose 622; inflorescence, terminal or a corymbose cyme, with about 10 flowers; calyx, polysepalous, with 5 sepals, green, companulate, 2 to 3 mm, long; corolla, tubular at the base, dilated at the top, five-lobed, glabrous, white, the dilation of corolla 8 to 9 mm; androecium, with 5 stamens, each 2 to 3 mm long, inserted near the neck of the tubular portion of the corolla; gynoecium, one, superior, 7 to 8 mm long, with a spindle-shaped stigma. Fruit, an ovoid berry, 9 mm in length, 6 mm in diameter, 642 mg in weight, 586 microlitres in volume; fruit colour, hyacinth blue 40; pulp, scarlet 19/2; juice, shrimp red 616/3. Seeds, lanceolate, 5 to 6 mm in length, 4 mm in diameter, black, each 28 mg in weight, 42 microlitres in volume. Generally, the flowering takes place during April and May. In some cases, it might start even by the end of July. The peak flowering season, however, was observed to occur by the middle of May. The small fruits take a lot of time to develop and mature. They start ripening from November and continue to do so till the end of January. Mature fruits were also observed on some bushes as late as April. These fruits were, probably, the outcome of the July blossoming. The average yield of a medium-sized garnu bush was found to be 272 grams. The moisture content of the fruit is 64 per cent, and the total soluble solids of the fruit-juice are 25.8 per cent. This amount is considerably higher than that of other fruits. The fresh fruits contain 1.51 g of acids, 10.80 g of total sugars, 10.77 g of reducing sugars, 0.03 g of non-reducing sugars, 0.42 g of tannins, 1.39 g of pectin and 1.83 mg of vitamin C per 100 g.
The protein content of the fruit is also good, being 4.09 per cent. The total mineral content of the fruit, as represented by its ash, is 1.621 per cent. Similarly, the percentage content of phosphorus, potassium, calcium, magnesium and iron in the fresh fruit is 0.057, 0.504, 0.051, 0.052 and 0.007, respectively. The fruits are eaten along with the seeds. They are sweet in taste and of fairly good quality. As stated earlier, the small fruits of garnu are commonly eaten and are also offered for sale at certain places. As it is evident from the chemical composition of the fruit, it is highly nutritious and is a very good source of protein. The content of total soluble solids is very high and indicates the possibility of this wild fruit being dehydrated and processed. 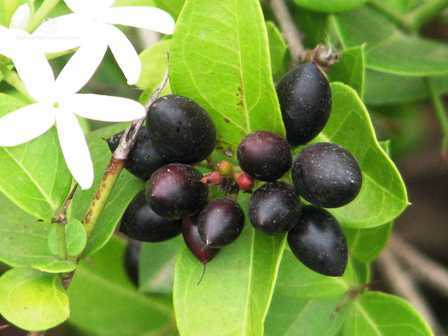 The bushes of this wild plant are thorny and are very effective as a fence and are mainly used in the villages for this purpose. 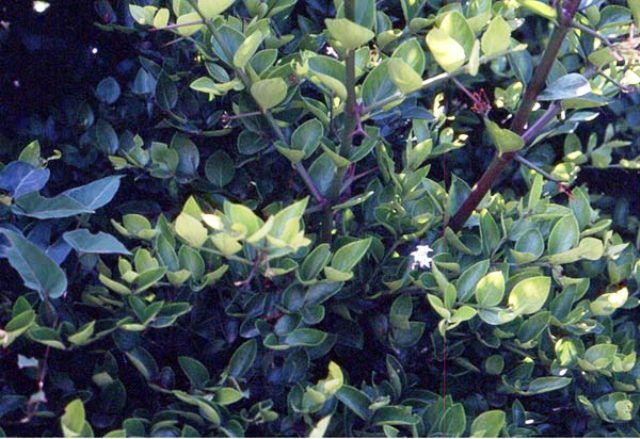 These bushes are very hardy and drought-resistant and can grow even on very poor and rocky soils. Therefore they can be used for afforestation in soil conservation. The leaves are fairly rich in tannins (9-15 per cent) and constitute a promising tanning material, particularly in combination with other tanning stuffs, such as the twigs and bark of wild Himalayan amla (Emblica officinalis).